Note: The complete flyer is below, as well as two other cards in response to her flyer which I received in the mail responding to Barbra Williamson's flyer. 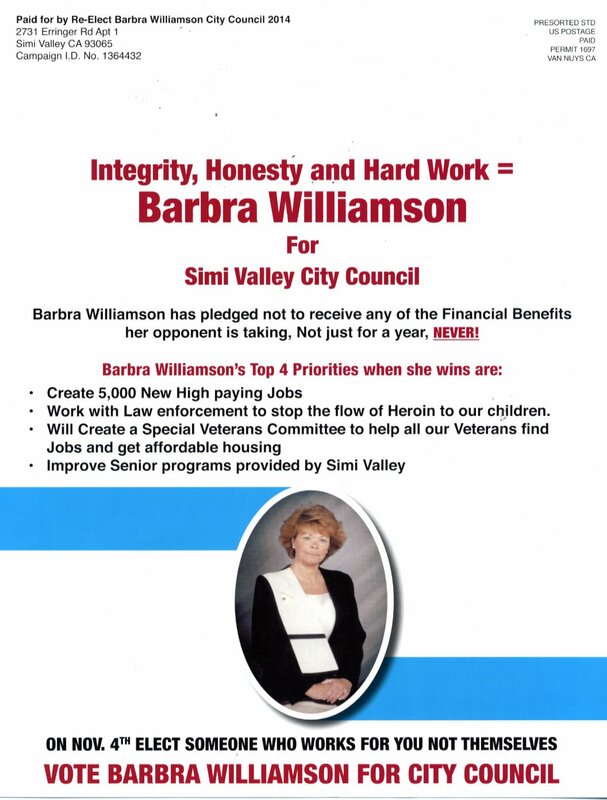 Barbra Williamson recently sent out a campaign flyer attacking Glen Becerra. What is written on that flyer is quite interesting and in my opinion most seems to either be deceptive or flat out false. It seems to me that she is willing to say anything in an attempt to get back on the City Council. I guess she misses the power and control, as well as people fearing her. You should also look at who Barbra Williamson associates with, such as Pandolfi, who's wife was involved in the robo-call lawsuit (robo-calls from an anonymous source with statements which were questionable, at best). I might also point out that Williamson is the only canididate for Council who used robo-calls, although there is no proof she was involved with the anonymous call. There are other articles which involve her and her associates. The Acorn article is quite interesting and shows a very clear picture of whol Barbra Williamson is, yet I don't think that she realizes that. The three prominent women who endorsed her said that that Williamson agreed to run a clean campaign. In the Acorn article Williamson claims that she never made that agreement. So, who are will supposed to believe, Debbie Thomas, Judy Pepiot, Paula Cornell or Barbra Williamson? It seems pretty clear, based on track records, who is far more believable and who can't be trusted. The Acorn article also says: "I think people want the truth," she said. "If I thought for one minute that (the mailer would backfire), I wouldn't have done the piece." I doubt that the thought about it would backfire, which shows who she is, but then she should answer the question about whether she was given a ride home from the SVPD when she was drunk and give all the details, but she won't. Barbra Williamson's comments in the Acorn quite telling as well with respect to her attack on Becerra's TOTAL money received for being on the Council, which she admits applies to her as well, actually more so since he has received far more money, including a pension (more below). The RED text is from Barbra Williamson's flyer, which I will make some comments on. If you notice, there are no references on her flyer, so it can be difficult to figure out what she is actually talking about, which I think is something that is intentional. 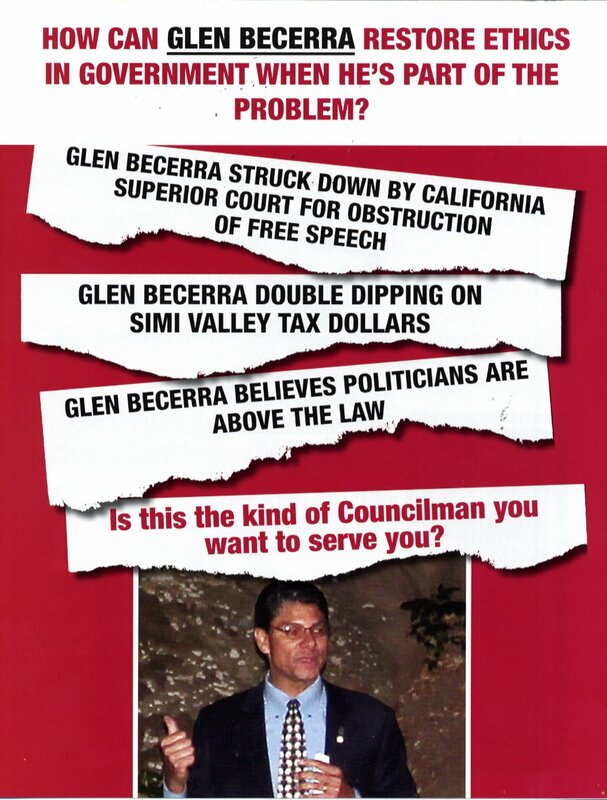 HOW CAN GLEN BECERRA RESTORE ETHICS IN GOVERNMENT WHEN HE IS PART OF THE PROBLEM? 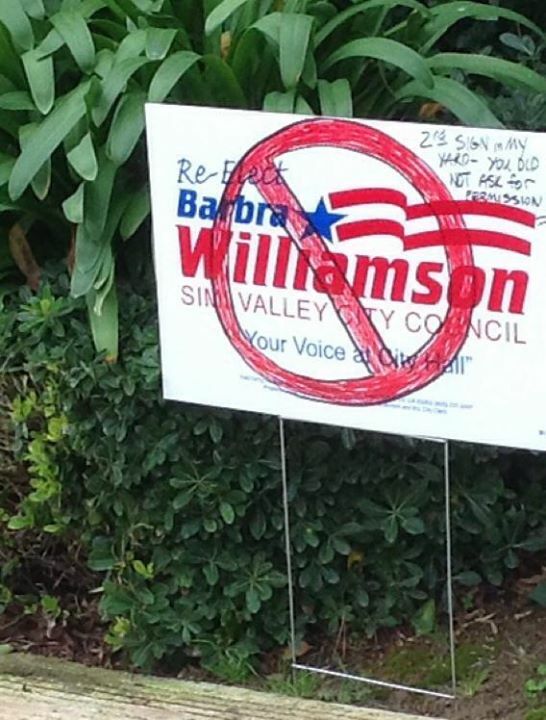 One could argue as to whether this is true or not, but it is certainly the case that Barbra Williamson is not the solution as she is a far bigger problem than Becerra could ever be. This appears to be false as Glen Becerra was not struck down, nor am I aware that he ever obstructed free speech. At a guess, Williamson is talking about the anonymous robo-call lawsuit which was filed in order to try to find the people behind it. Why did they feel the need to hide who they are from the public? Since Williamson is using this, could it be that she was one of the people behind those anonymous robo-calls? This might be in reference to the Council benefits, but it is EXACTLY what Williamson herself did for 20 years. It is unclear as to where this comes from. In my opinion this applies to Williamson instead of Becerra since I do not recall such an attitude from Becerra, but I have from Williamson. Look at Williamson's comments regarding her illegal campaign donations. Is this the kind of Councilman you want to serve you? So we should want a deceptive self-serving politician like Williamson instead? Same as above. Perhaps Williamson thinks that repeating something enough times will make people believe it and ignore that it applies to her. This is quite deceptive since it does not mention the number of years he has served. If you calculate what Williamson has received, it would be over $1,000,000.00. Remember she was a pension (or two) from the City and she might have delayed her health care benefits, so the total amount she extracted from the City could far exceed others. It would be interesting to get a total of ALL the money which Williamson has received, especially since she is making this an issue. What is really telling is Barbra Williamson's comments to the Acorn about this: "Having said that, I'm not saying I didn't do the same thing,". So she attacks Becerra and she has taken far more tax payer money and she thinks that she is telling the truth??? Really? I would like to see proof that he actually believes that. Williamson violated the Code of Conduct and then there is the issue of illegal campaign donations, which is quite interesting as she was on the Council when the law was passed, but claimed she was not aware of what it actually meant. Right there is a good reason to keep her off the Council. One has to wonder how someone becomes a political ally, but I guess that sounds better when you attack someone. Perhaps Williamson should take a look at her ally, Pandolfi, and all of his legal issues. Also notice the word "implied". That is just made up by Williamson, but it gets better because she is playing games with quotes. No Big Deal. "Anyone can make a Mistake." Notice that the "No Big Deal" is not actually in quotes by her. That means that Becerra did not say that, instead it is what Williamson thinks that he implied with no basis shown for her belief. Perhaps Williamson does not think that anyone can make a mistake. If that is the case then I want to find out whether the story I heard about her being pulled over for DUI and instead of being arrested, she was taken home, is true. Williamson refuses to answer, which tends to indicate that it is actually true. 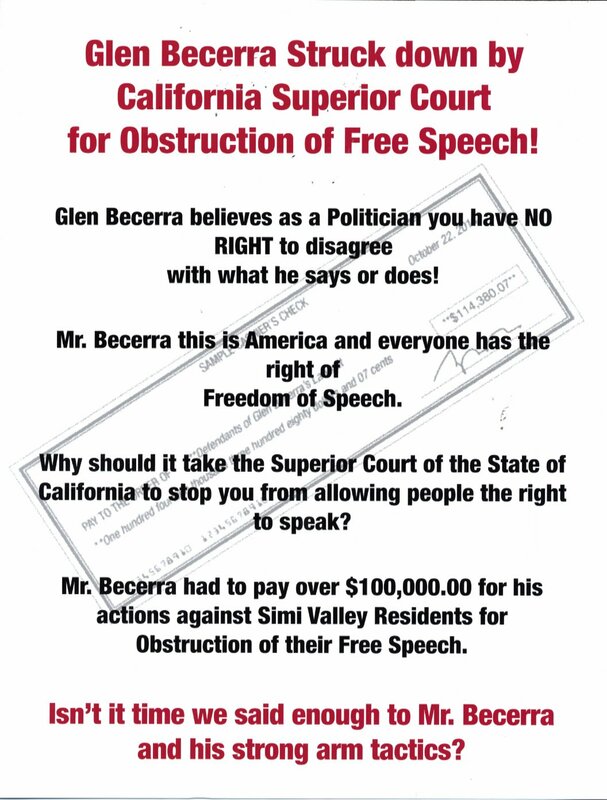 Glen Becerra Struck down by California Superior Court for Obstruction of Free Speech! 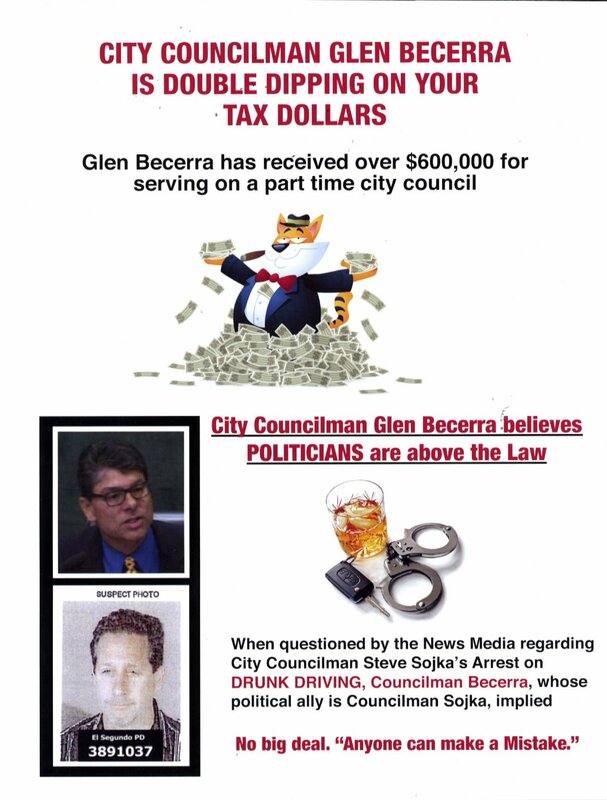 Glen Becerra believes as a Politician you have NO RIGHT to disagree with what he says or does! I have not seen that from Becerra, but I have certainly seen that from Williamson, numerous times. Mr. Becerra this is America and everyone has the right of Freedom of Speech. At least this is one statement which is true. Not very good percentage of accurate statements, but what I know of Williamson, it fits with how she operates. The problem is that Williamson tries to silence the free speech of those who are pointing out her false/deceptive statements. Why should it take the Superior Court of the State of California to stop you from allowing people the right to speak? If this is about the robo-call lawsuit, this is very deceptive. It was NOT about stopping the right to speak, but it was about the people who were attacking others with false statements and hiding who they were. Mr. Becerra had to pay over $100,000.00 for his actions against Simi Valley Residents for Obstruction of their Free Speech. This tends to indicate that it was the robo-call lawsuit, but from what I heard it is false that Becerra had to pay that amount. The Plaintiffs were forced to pay around that amount, but it would have been split among all of the Plaintiffs. So unless Williamson can prove that ONLY Becerra paid it, this is just another false statement from her. Isn't it time we said enough to Mr. Becerra and his strong arm tactics? Another thing that Williamson needs to explain. I have seen her strong arm tactics, but it seems I have missed Becerra doing it. Perhaps Williamson is confused. Now this is a good joke, but I hope people are not fooled by her. If you read the other articles, you will see the only hard work Williamson has done is to attack others and promote her own self-interest in my opinion. What does it say about when Williamson uses "re-elect" on her campaign signs and web page? Common use is for someone who is currently in office, so that does not seem very honest to me. When you look at this flyer, the word "Integrity" certainly does not come to mind. Barbra Williamson has pledged not to receive any of the Financial Benefits her opponent is taking. Not just for a year, NEVER! This is quite funny. Since Williamson is out of office, if she were to get elected, she would not qualify for the previous benefits that she received. I also suspect that she would NOT be turning down the $400/month car allowance. I doubt that she would actually turn down ANYTHING which she could get. Has she EVER turned down anything in the past? Why expect she would change now? I guess it is easy to claim to make a pledge when you really don't have any choice. The City stated that Williamson would not be eligible for the benefits if she were to get back on Council. In the Acorn article, Williamson said that she would have given up the benefits, yet she was on the Council at the time and she DIDN'T give up anything. I guess she is ever hopeful and thinks that the voters will change their minds about wanting her on the Council again. She said that the voters were the term limit and they voted for another person. Exactly how is she going to do this? It is IMPOSSIBLE for her to create ANY jobs on her own. The Council can ONLY create government jobs. Is she saying that she is going to create 5,000 government jobs? I doubt that the rest of the Council would go along with that. This makes this priority quite deceptive and bogus. Work with Law enforcement to stop the flow of Heroin to our children. Is she going to become a volunteer officer? How exactly is she going to work with SVPD in doing this? It seems more likely she will just be trying to tell them how to do their jobs, which would create a mess. Also, what about other drugs? Why is she ONLY interested in Heroin? Perhaps because she is trying to hop on the bandwagon in order to try to get elected. Again, she can't do anything on her own. This sounds like just another statement by her in the hopes that Veterans will be fooled by her and vote for her. Also, she should explain exactly how she is going to pay for all this and exactly how she is going to try to accomplish this. Yet again, this is not something that she can do on her own and it seems like another attempt to get a group of people to vote for her. Hopefully voters will see who she is and what she is doing. This is a very good idea and something that I have been saying, but it also means that Williamson does not qualify as she works for herself, as well as making false/deceptive statements to the public for her own personal gain. This is something that you should NOT do if you want someone who will actually represent the residents of Simi Valley. Look at all of her past actions and ask yourself why she did not do all of the things in her 20 years on the Council that she suddenly claims she wants to do now. Notice what the upper right corner says: "2nd SIGN is MY YARD - YOU DID NOT ASK FOR PERMISSION". This means that Williamson violated the law. Remember her comments claiming that someone else thought that politicans were above the law, this just confirms that she has that view. After reading this article, you might want to read some other articles relating to Barbra Williamson, especially the ones with quotes from her, where show you exactly who she really is.